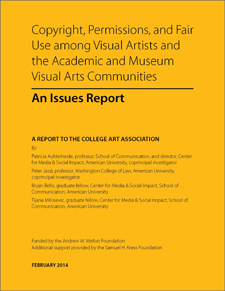 CAA is pleased to announce the publication of Copyright, Permissions and Fair Use among Visual Artists and the Academic and Museum Visual Arts Communities: An Issues Report. Endorsed by CAA’s Board of Directors on January 24, 2014, the report is now available on CAA’s website (here) and will also be distributed in printed form at the upcoming Annual Conference in Chicago. The report was written by Patricia Aufderheide and Peter Jaszi, professors of communications and law, respectively, at American University; and graduate fellows Bryan Bello and Tijana Milosevic. Aufderheide and Jaszi are the project’s lead researchers and two of its principal investigators. Their report summarizes 100 interviews of art historians, artists, museum curators, editors and publishers describing issues related to the use of third-party images in creative and scholarly work. The research was further informed by a CAA membership survey on fair use and a review of relevant literature and legal precedents. This issues report reveals a situation in which uncertainty about copyright law and the availability of fair use, particularly in the digital era, has made many practitioners risk-averse, too often abandoning or distorting projects due to real or perceived challenges in using copyrighted materials. The report was read by the project’s Principal Investigators, Project Advisors, and members of the CAA Task Force on Fair Use, its Committee on Intellectual Property, and a Community Practices Advisory Committee. A full list of these individuals appears as an appendix in the report. By identifying key concerns, the Issues Report makes an important contribution toward addressing questions related to the use of copyrighted materials and the understanding of fair use principles. It represents an important step in CAA’s work to develop and disseminate a Code of Best Practices for Fair Use in the Creation and Curation of Artworks and Scholarly Publishing in the Visual Arts. Over the coming year, CAA will host small group discussions in five cities (Chicago, Dallas, Los Angeles, New York and Washington, D.C.) among visual arts professionals, guided by Professors Aufderheide and Jaszi, to identify areas of consensus in how fair use can be employed. These deliberations will undergird the development of a code of best practices, which will be reviewed by the project’s Principal Investigators, Project Advisors, members of the CAA Task Force on Fair Use, its Committee on Intellectual Property, and a Legal Advisory Committee. Once finalized, it will be presented to the CAA Board of Directors for approval and widely disseminated. During CAA’s 102nd Annual Conference in Chicago (February 12–15, 2014), Aufderheide and Jaszi will discuss this project publicly with Anne Collins Goodyear, CAA president; Jeffrey Cunard, co-chair of CAA’s Task Force on Fair Use; Christine Sundt, chair of CAA’s Committee on Intellectual Property (CIP), and Paul Catanese, associate chair and associate professor in the Department of Interdisciplinary Arts at Columbia College and chair of CAA’s New Media Caucus. The session will take place on Saturday, February 15, from 12:30 to 2:00 p.m. at the Hilton Chicago. CAA’s Fair Use Initiative is supported by a major grant from the Andrew W. Mellon Foundation. It also received generous preliminary funding from the Samuel H. Kress Foundation.